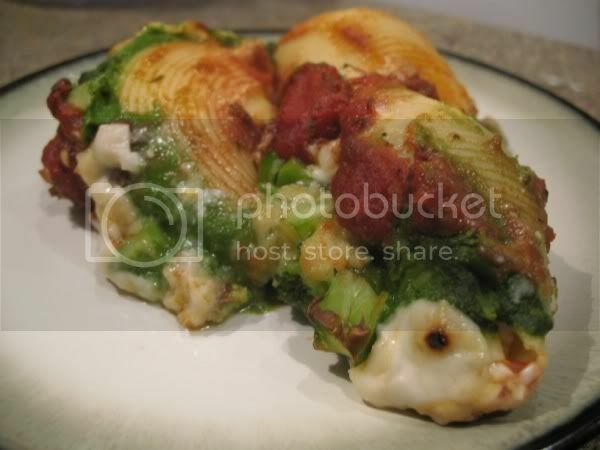 I made these shells with more veggies in mind. It was actually supposed to be a lasagna but I didn't have lasagna noodles. I made it with Mean Green Spinach sauce, but about 1/2 the recipe was used, so if you are *just* making this, then 1/2 the recipe. The Mean Green sauce is VERY spinach-y. If you don't like spinach a lot, then I would suggest to pick another sauce or omit. *Make whichever tofu ricotta you like. Chill in refrigerator. *Cook seitan until crispy and mix with ricotta. Chill while you prepare dish. *Cook large pasta shells as directed, and rinse with cold water. Set aside. Do not drain water. Throw broccoli in boiling water and cook a few minutes until tender but not mushy. Chop and set aside. *Make Mean Green Spinach Sauce and white sauce while shells are cooking (or make spinach sauce the day ahead and chill). *Pour a little spaghetti sauce in a small square nonstick baking pan. *Fill cooled shells with ricotta mixture. Top with broccoli. *Place each shell in pan, and top with Mean Green Spinach Sauce, White Sauce, a little more shapgetti sauce, and optional vegan cheese. *Bake at 350 degrees for 30-35 minutes, until well-heated through. Broil to melt cheese the last couple minutes, if using. Keep an eye on it. Blend everything very, very well in a blender and place on low heat until thickened and just barely boiling. Makes a crazy bright green sauce. I would suggest to eat it with another sauce. It's strongly flavored, but good in applications like this. Melt margarine in a saucepan, then whisk flour and nutritional yeast until crumbly and toasted. Do not burn. Add 1/4 c soy milk and break down chunks. Add other 1/4 c soy milk and keep stirring until thickened but not too thick. Set aside. Oh yum! This sounds / looks delicious! Mmm, yes please! This recipe sounds great, thank you! I love cilantro and this looks so yummy!